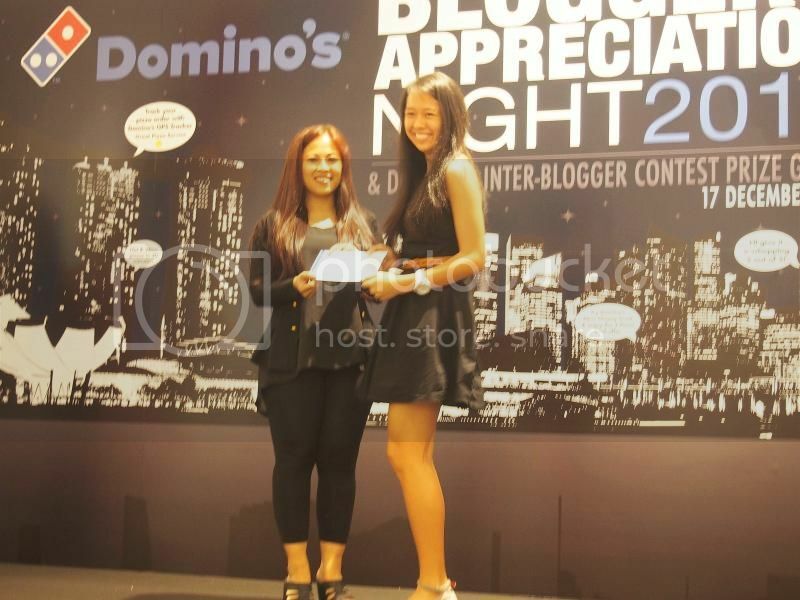 Went for Domino's Pizza Year End Appreciation Dinner, met some new and familiar faces over there. 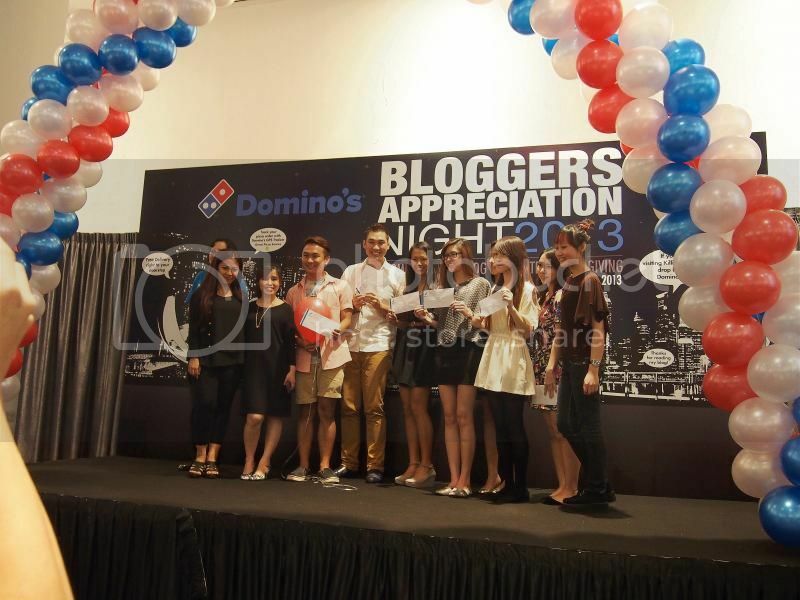 The event was like a year end gathering and also the prize presentation for Domino's Inter Blogger Competition. So happy that Dawn, Damien and Malcolm won the top 11! Hahaha! 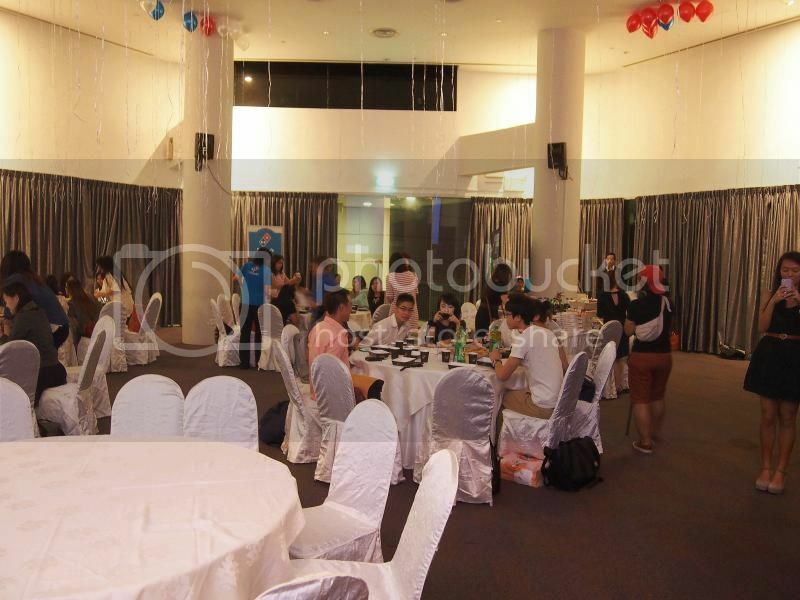 The event was held at level 5 of SCAPE Treetop, and it looks like someone's getting married! Hahaha! 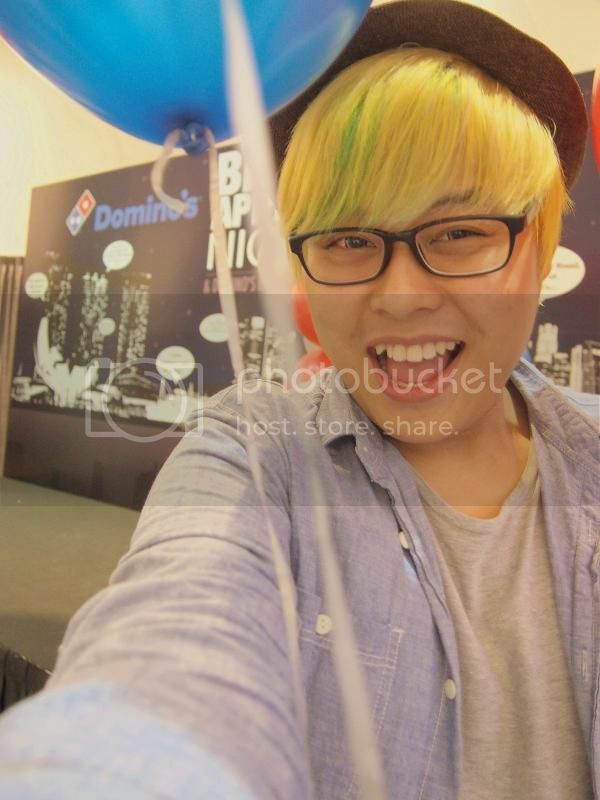 Its quite grand leh for a Domino's Pizza event. 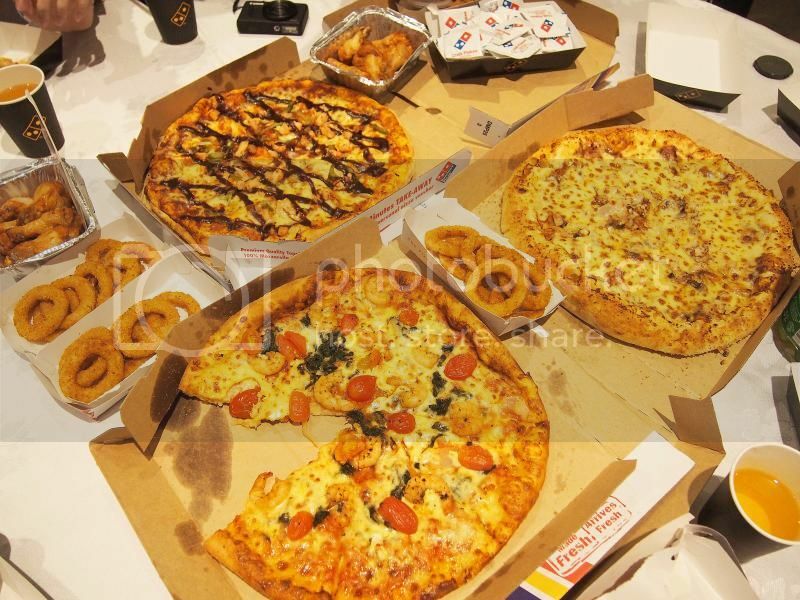 Mingled around and we were served with tons of food, there's Pizza (DUH), Chicken Crunch (MY FAV)! 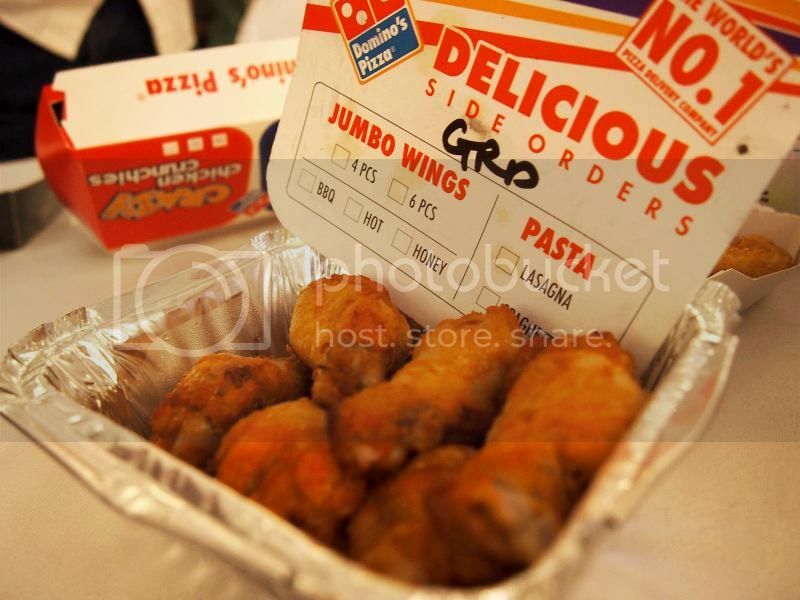 Onion Rings, and also their Golden Roasted Drummets. Then after that, Damien's name was announced, but sadly he is still on the plane back to Singapore from Bangkok so he couldn't make it, so Malcolm was there to collect on his behalf, then Malcolm's name was announced, and he went up stage to collect the prize again. The emcee asked: So are you Damien or Malcolm. LOLOLOL!!! That was kinda awkward for him. Hahah! Saving the grand prize winner for the last, we all know who the winner is, and its William, this is his 3rd consecutive win already. Hahaha! 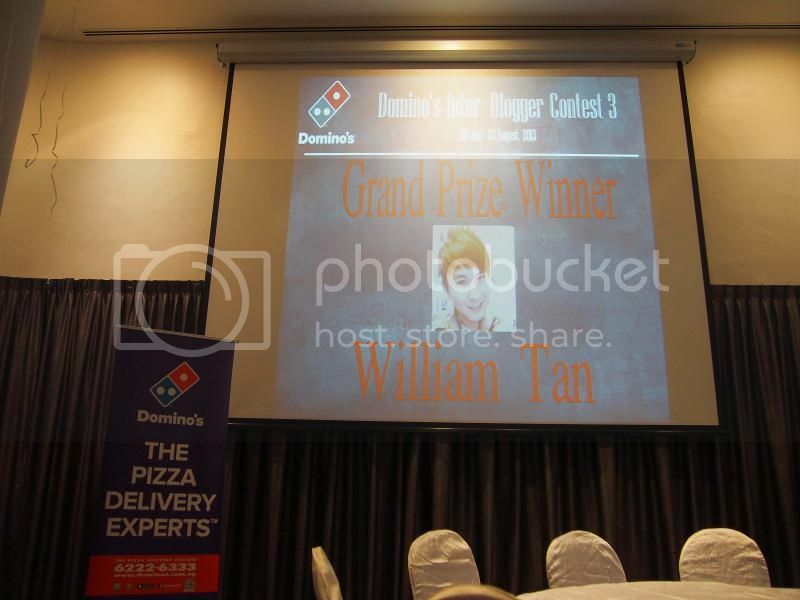 This is my first time having talking to William, through this event I also got to know him better. Somemore he is very humble about his winning la, so yea. +Point!!! Next, the winners get on stage for a group photo, and tadanggg. 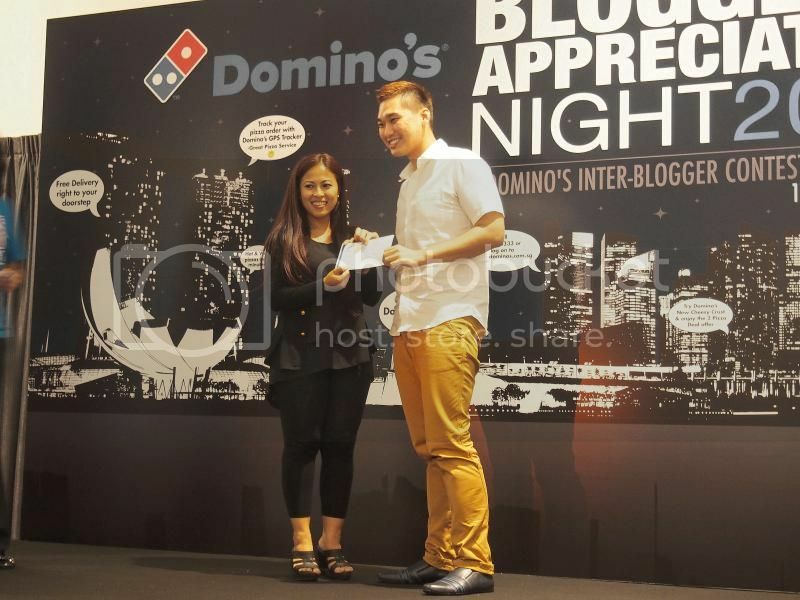 That marks the closure of Domino's Inter Blogger's Competition Round 3, and they're starting round 4 soon. 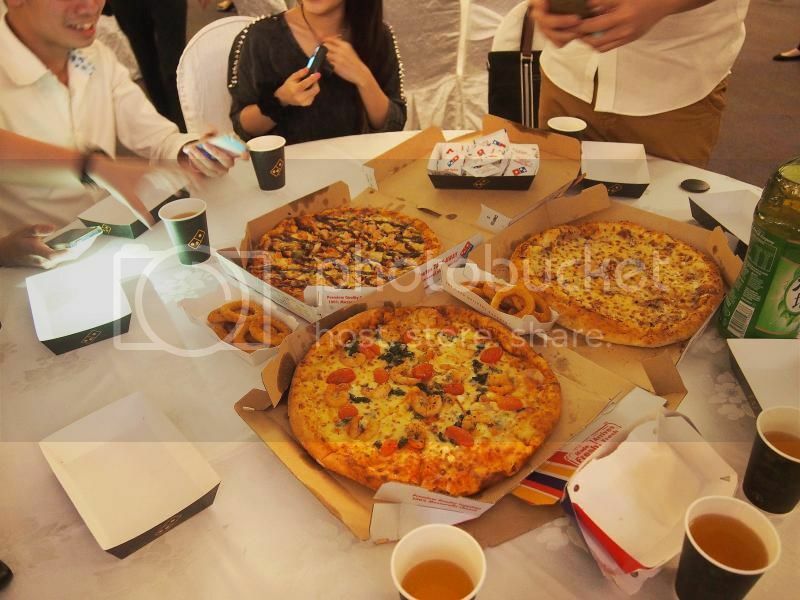 I'm still thinking if I should join, it between the period of January to March, and I can order LOTS OF PIZZAS during Chinese New Year period. Hahah! Shall see. Here's a video of how it looks like when you cut it open while its hot. 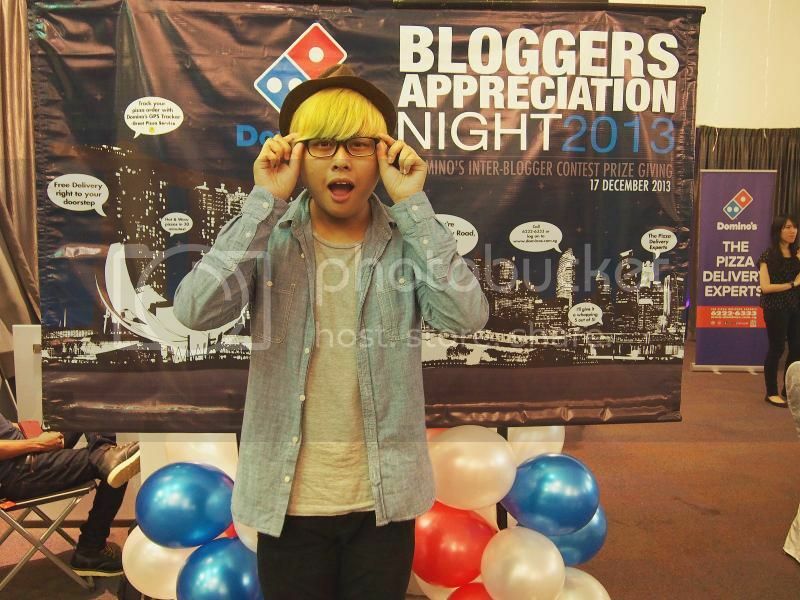 Took this video back when I attended a event by Domino's. 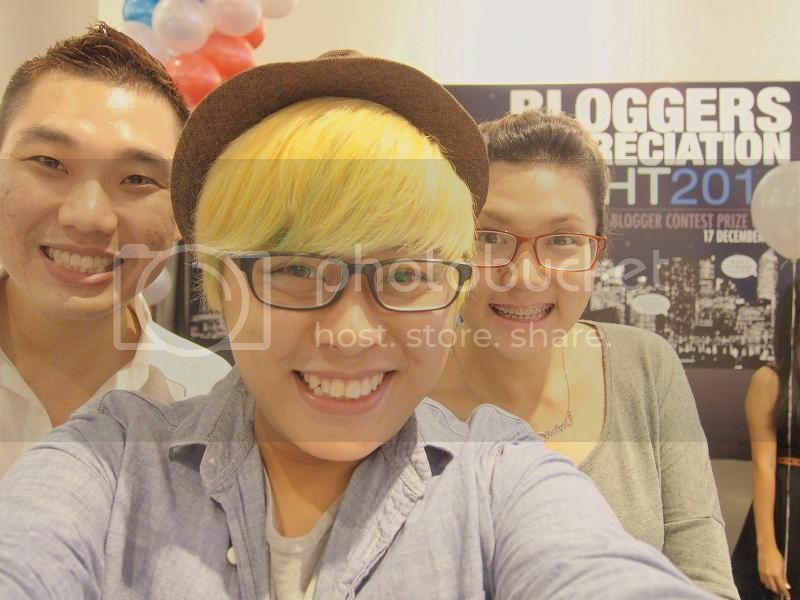 Manage to take a photo with Malcolm and Tselyn. Its been awhile since I last saw them. 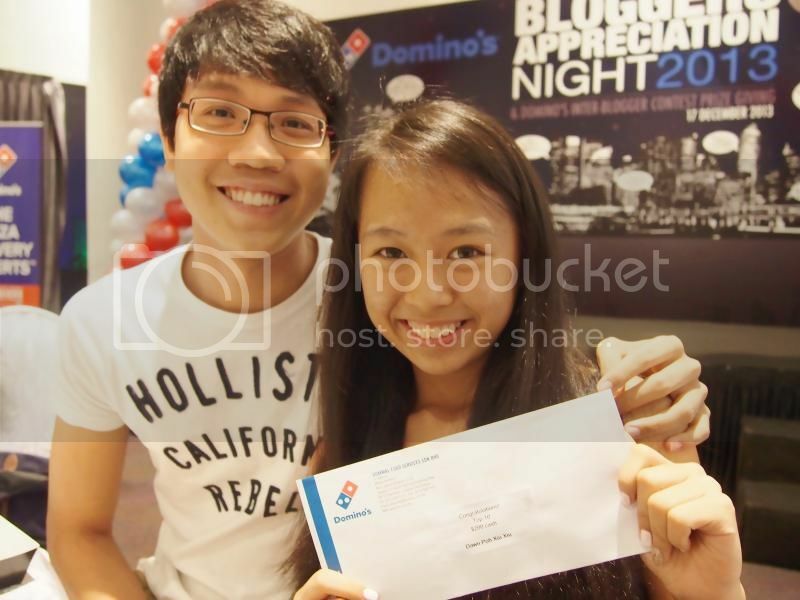 A photo of Dawn Twinnie's winning prize and Bryan (Her Boyfriend). SO YEAP! I've come to the end of this post. Liked all of these details about this appreciation dinner. At one of the local Los Angeles event venues I have to throw an annual luncheon for the employees and thinking to give them custom gifts. 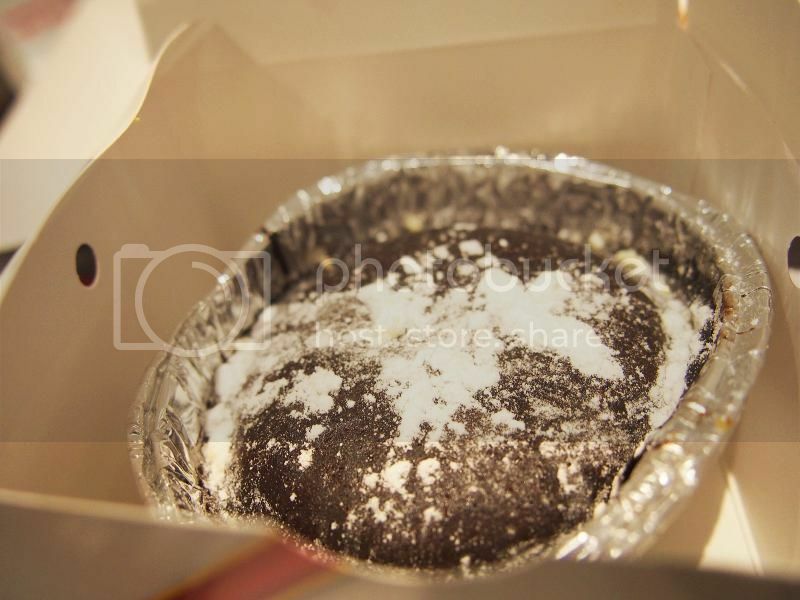 Can you share some ideas on what to gift them?